There are lots of places we draw inspiration from when it comes to looking for ideas in our hobby. The real world is full of things we can use and so is the wealth of 40k background. But outside of making up our own "fluff," we have to rely on what someone else gives us either in words or pictures. Words allow us to create an image in our minds where artwork lays it out in front of us. I chose this image (and idea) this week after seeing this on the Black Library site. 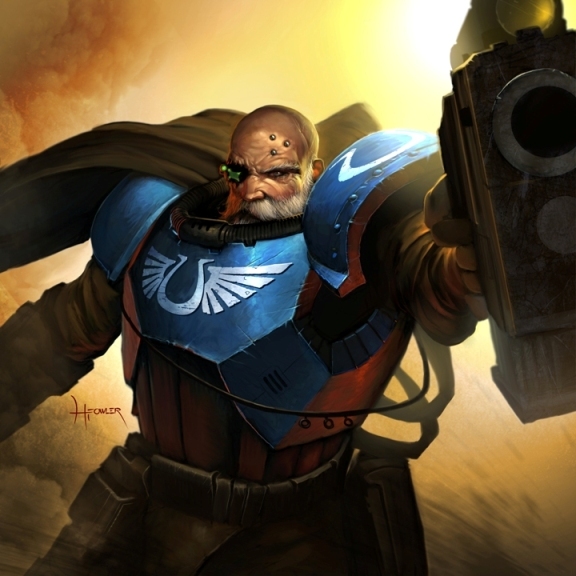 Most of us have seen the GW model and the artwork for the is guy in the Space Marine codex. This adds another layer to the background of the model for me. Granted, sometimes the different versions can be conflicting, but that doesn't always bother me. I attribute it to each artist's interpretation. Being the kind of hobbyist that I am, I love when things are spelled out for me. Either written down or more preferably in pictures. I love looking at all the 40k artwork that I can find. It fills in the gaps for me. Pictures allow me to recreate what I see. They show me what it looks like and I'm able to take it from there to the tabletop. I have trouble taking words and translating that into tabletop models, but give me a picture and I'm all set. Being artistically inclined, I love the rich artistic resources available from GW. I have lots of the artwork books released over the years, particularly the Jes Goodwin sketchbooks which are absolutely fantastic and packed chock full of lots of ideas - some released, some not! I think that artwork is a massive factor for many people, although most people won't even realise it! Definitely concur. The Horus Heresy Collected Visions book is my go-to source for 40K material. The book is so chocked full of pictures that even though I flip through it about once every couple of months, I still feel like I'm seeing stuff for the first time. oink: You may be right, we just "like" certain things or aspects about the hobby. It really doesn't matter why in the end I suspect. I wish I had more of the art books. I find myself thumbing through them repeatedly when I do come across them in hobby stores. Gary: That happens to me with lots of books... I pick it up after a long time of not having looked through it and find something new. I got to say, I know how you feel. Sometimes to get an idea for a model, I prefer to look at others work, or art to get a feel for a model. Not steal a design, just get a taste of potential! I feel like it is good practice to share your work and look at others to better your own skills! I know for me, I compare against local friends who have models and looking at blogs. It's a wonderful tool to utilize. Fayte: Right, it's not like you're going to steal the whole thing, but you're looking to see how others interpret what's out there. It's amazing sometimes to see how different the interpretations of the same thing can be.